As mentioned in our Top 10 Food Safety Myths post, the rinsing of raw meat, and chicken in particular, does not reduce the risk of food poisoning by ‘washing away’ the bacteria. In fact, it turns out with chicken; it increases the risk with the water potentially splashing the bacteria on your skin and surfaces. Here’s some in-depth information on the risks of rinsing. 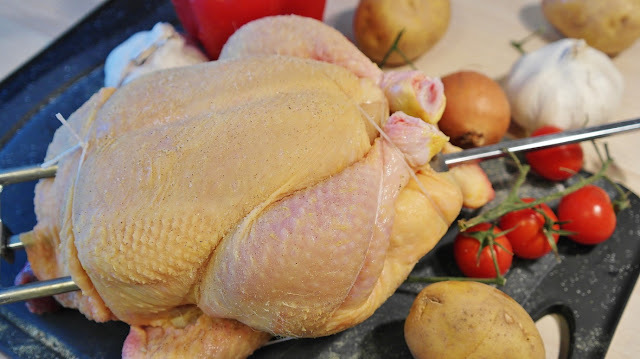 The bacterium in question is Campylobacter, with the two species C. jejuni and C. coli causing most infections, with around 280,000 people affected in the UK per year, with four out of five cases caused by raw contaminated chicken. Despite being the most common type of food poisoning in the UK, only 28% of people know about campylobacter, with most (90%) only knowing about salmonella and E. coli. Washing raw chicken under a tap risks splashing the bacteria onto surfaces and your skin, not killing the bacteria, but increasing the risk of cross-contamination and ultimately, causing food poisoning. Only a few cells are needed to cause poisoning, and so it’s important to skip this step in your food preparation. Shockingly however, the Food Standards Agency reveals that more than two out of five cooks say they still routinely wash chicken, which shows how unknown the dangers are. The only safe way to kill harmful bacteria such a Campylobacter is so cook the meat at the correct temperature, which is an internal temperature of 145°F, before removing from the heat source. So, what are the symptoms of Campylobacter poisoning? The symptoms, according to the NHS website, include abdominal pain, vomiting that lasts for more than two days, diarrhoea that lasts more than three days, signs of severe dehydration and double vision, to just name a few. Most cases last 2-5 days, however there can be more severe cases. These can lead to Irritable Bowel Syndrome, Guillain-Barre Syndrome (a serious disorder attacking the nervous system), and Reactive Arthritis. In extreme cases, it can be fatal, with estimates indicating more than 100 deaths per year. Treatment of the food poisoning can be self-care with drinking lots of water, resting and taking oral rehydration salts if necessary. However more severe cases are advised to seek medical help who will ultimately treat with antibiotics. So despite how logical it seems to rinse raw meat before preparing and cooking, it’s really not a good idea, and isn’t worth the risk of getting food poisoning. Click here for more Food Safety Myths and information.